Can toddlers and pets ever peacefully co-exist? The good news is it IS possible, you just need to follow a few simple precautions. There’s no doubt both pets and toddlers bring a huge element of joy into the household. However, there’s also no denying that together they can wreak havoc! If you’re considering getting a pet, or you already have a pet and you’re worried about your toddler’s safety, here you’ll find out everything you need to know to ensure that no problems arise. 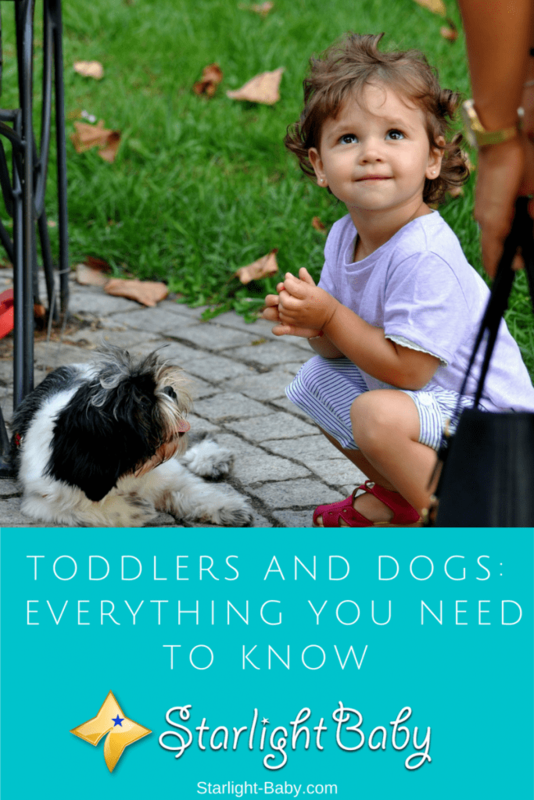 Toddlers And Dogs – A Recipe For Disaster? Dogs are known as man’s best friend so it’s no surprise they remain the number one household pet in America. However, while they may well be man’s best friend, it can take them a while to warm up to a toddler! The trouble is, to your toddler, a dog is just like a big stuffed animal, with the added bonus that it moves, makes sounds and provides hours of entertainment. They have no clue about dog behavior so they aren’t going to be able to read the signs if the dog isn’t happy. They see no reason why they can’t tug at the dog’s fur, just like they would a stuffed animal. Toddlers are also renowned for playing rough and may prove a little too overbearing for your dog to handle at times. From a dog’s point of view, they don’t have the ability to understand toddler behavior. All they know is suddenly they have a tiny human running around chasing them, pulling their tail, climbing on them and poking them. Let’s be honest, if you had somebody doing that to you, it would get annoying very quickly! This misunderstanding between dog and toddler is what leads to potential problems. However, that isn’t to say dogs and toddlers should never be kept together, it just means you’re going to need to set a few rules and take a few precautions to ensure no serious issues arise. Supervise Them Constantly – The number one rule and by far the most important is to absolutely never leave your toddler alone with your dog. Even the friendliest dog that you’d never in a million years consider would bite, can snap if they feel threatened or fed up. The majority of dog-bite incidents involving toddlers have occurred because of inadequate supervision. So, always monitor how your toddler interacts with the dog and don’t be tempted to leave them alone, even for a minute. Teach Your Toddler Basic Petting Rules – It’s important to realize that although your toddler can understand basic elements of responsible petting, they aren’t yet old enough to be trusted to follow them 100% of the time. However, it is still important to teach them basic rules such as when they do want to pet the dog, they have to be gentle. Also, ensure they know not to disturb the dog when it is eating or sleeping. Allow Your Dog To Have A Time-Out – Giving your dog a little time to themselves each day will do them the world of good. Having a toddler running around isn’t just exhausting for you, it’s hard for them too. Placing a safety gate between two rooms can help separate them for short periods of time as and when it is needed. It’s also worth noting that the dog should always be able to get away when they need to. Make sure they have a place where they feel safe such as a crate, bedroom or even just a dog bed where your toddler knows not to disturb them. Ensure Your Dog Is Trained – Of course, it isn’t just your toddler you need to worry about. It’s important to ensure your dog is well trained. They don’t need to be able to do elaborate tricks, but basic commands such as stay, sit, down and leave are all useful commands to learn. It’s also a good idea to enroll them in an obedience class, if only for the socialization. The more your dog socializes with people and other toddlers, the calmer they will be around your little one. Learn Your Dog’s Signals – While your toddler may not be able to pick up on your dog’s body language, with a little practice you can. When supervising your toddler’s interaction with the dog, watch out for early signs they may be giving out. A growl or bite are usually the last resort and most often than not, dogs provide many small signals prior to that. These are the basic rules of toddler and dog safety. Being vigilant and constantly supervising the time your toddler spends around the dog is the main way you can ensure nothing bad happens. Overall, while it may be hard work, many experts do suggest that pets can actually be beneficial to toddlers. Provided you take the right precautions, there’s no reason your little one and your pet pooch can’t get along harmoniously. Ours just hit that age where animals are especially fascinating. Whenever we see a dog walk by he rushes to it and says ”Mom, mom, look! I want one!”. Me and my partner just aren’t sure whether it’s a good idea because I’m currently pregnant again and a dog just seems like a lot of responsibility on top of two children. It’s hard trying to explain it to him though. He really wants a dog of his own. After reading this article I see that I didn’t even take in consideration that the dog has to be properly trained. I completely forgot the importance of it. I think we will hold on with buying a dog for our toddler. It is a lot of work even though animals do bring great joy to families and kids. Maybe in the future. Yes, I do think you should hold off buying a dog for now because as you’ve said, taking care of a dog takes a lot of work. You may not have enough time for it considering you are expecting your second child. You could probably get them one when they’re a bit older and able to understand how dogs react to their actions. And when they’re older, they will also be able to help you take care of the dog. yeah I totally agree with you Jane because buying a dog is a big responsibility and plus that you are pregnant I think it won’t be a good option for you now to buy a pet. You’re right, Mohamed, a dog is a big responsibility and will not be appropriate to Jane’s current situation – with a child plus a baby on the way. Raising a dog is like raising a child as well so it would be very difficult to multi-task taking care of two kids and a dog. That would be very stressful. Well, the combination between a toddler and a dog may be a disaster but a dog is the best friend of a human, usually, a dog loves kids and they are protective and they play a lot of kids. Children develop they’re psychical better if they raise with a pet near them. I think there are a lot of benefits for a child to own a dog! You’re correct about the benefits of raising a dog along with one’s child, however, the care of both the child and the dog may become too overwhelming later on. And if the child is still too young to understand how a dog reacts, it may spell trouble for the child in case he becomes too playful with the dog and the dog becomes aggressive. There are a lot of positive news about dogs protecting children so I’m sure it will be a good idea to get one when a child is a bit older. Training the dog and learning it’s signals in my opinion are the better tips amongst the other recommendations you listed above. Like the last person, wallet stated, it really can be disastrous leaving an unchecked dog alone with an innocent toddler. Things can go wrong, I’ve seen cases like that. However, taking the steps you’ve stated above can go a long way to ensure a safe and healthy relationship between the toddler and the pet dog. I also want to add a point to your tips. I think it’ll a great idea to go for a baby dog when picking a pet dog for a toddler. The dog hasn’t developed its natural instincts at this stage and is still innocent, same as the toddler. This way they can both grow, understand and bond together. Great tip there, Rumu, regarding getting a baby dog for a toddler. The idea of them growing up together sounds great. I’m sure parents would feel safer, and the child would be safer if the dog is given training as it grows so it will not show any aggressive behavior. An untrained dog could indeed pose a threat if the child and dog are not closely monitored. We have a child in a home and soon he will become a toddler. We also have a dog in our home. Therefore, soon we will have to tackle this issue. We have vaccinated the dog, we also bath the dog regularly, therefore, there is no chances of catching diseases from the dog. We don’t know yet how the dog will react to the child and how the child will respond to the dog. Thanks for sharing these tips. If you already have a dog, I think it would be best to slowly introduce the child to it. You must not be too trusting if the dog is near your child because we’ll never know how both of them will react when they’re face-to-face. It should be a matter of a careful observation for now. And it’s a good thing you’re already taking precautions like vaccination (or anti-rabies). As they always say, better safe than sorry. Amazing tips on how we can control the relationship our dogs have with our kids especially as regards ensuring that the dog doesn’t make the toddler feel frightened at any moment. However, it’s sad that I’m going to be one of those parents that wouldn’t want to do any thing with dogs for, even as an adult, I still have my phobia toward the dog and it’s just hard for me to stop. These are great tips on how to get your dogs and toddlers to coexist without much hassle. The truth is that most times, toddlers are ignorant of how a dog feels and behaves, so there is every possibility that they would over things and this might led to biting. But having a trained dog can solve this problem, as the dog would 90% understand the toddlers behavior. I saw one YouTube video clip where a dog allowed a toddler to climb its back and get some groceries from the refrigerator.